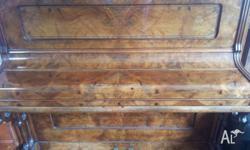 European EISENBERG upright piano and stool. FREE delivery, tuning and warranty. 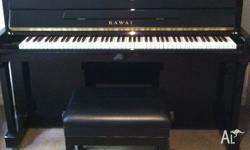 Finished in high gloss black (ebony) finish, this piano is a quality European built instrument and is perfect for home use. It has a very warm and typically European mellow sound, being made by renowned piano manufacturer, Petrof. Fully prepared from top to bottom, this piano is 100% ready to play and enjoy, and will last for many years to come. Preparing a piano for use (and for sale), takes much more than "just a good tune". Here in our own onsite workshop, this piano has been thoroughly prepared and inspected by a fully qualified, Piano Tuner's Guild (PTTG) approved, and Yamaha certified piano tuner. In doing so, this instrument was comprehensively disassembled, inspected and rectified where necessary. It was then thoroughly cleaned and polished, then tuned to A440 concert pitch, fully regulated and voiced. 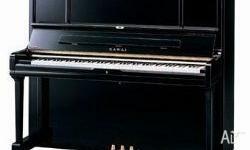 Only then is a piano truly ready for reliable function and years of enjoyment. All keys and pedals function exactly as they should with smooth and accurate levels of response. It has a full iron frame with no cracks. 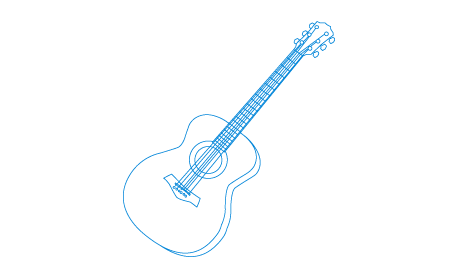 And solid pin block, bridges and soundboard with no cracks. For that reason, we offer this piano with a 3 YEAR WARRANTY. Overall dimensions are 103cm tall, 139.5cm wide and 54cm deep. 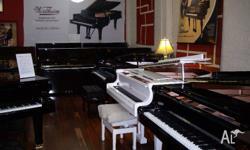 You are most welcome to try this piano yourself at our facility in Kilsyth (Eastern suburbs of Melbourne). Just call on ******** 745 + click to reveal to make a time. FREE DELIVERY and TUNING applies to Melbourne metro', Dandenong Ranges, Yarra Valley and the Mornington Peninsula. This is providing there are 5 stairs/steps or less and no extreme slopes or driveways. Delivery options for more difficult access is certainly available, as is delivery to other geographic areas. But this is not included in this auction. Call us for a quote. Contact is due within 48 hours of auction close and payment in full due within 10 days. Delivery (or pickup) to take place no more than 30 days after auction close. From specialist piano moving, transport and storage, to affordable pre-loved instrument sales, MPM is Melbourne's dedicated piano specialist. Because WE are piano people too. Call us on ********-745 + click to reveal . 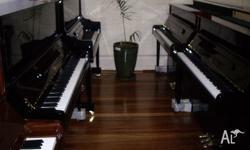 Melbourne Piano Movers - Specialist Piano Sales, Transport and Storage. A Hoelling & Spangenberg upright piano. Good condition except needs tuning but is a beautiful piece. Pick up only.